It feels somewhat appropriate to close out our string of band interviews previewing this weekend’s Austin Psych Fest 3 by hearing from ¾’s of Brooklyn’s The Vandelles. With a seeming inability to be corny or nostalgic, The Vandelles manage to span whatever gaps – real or imagined – that exist between the past and the future. 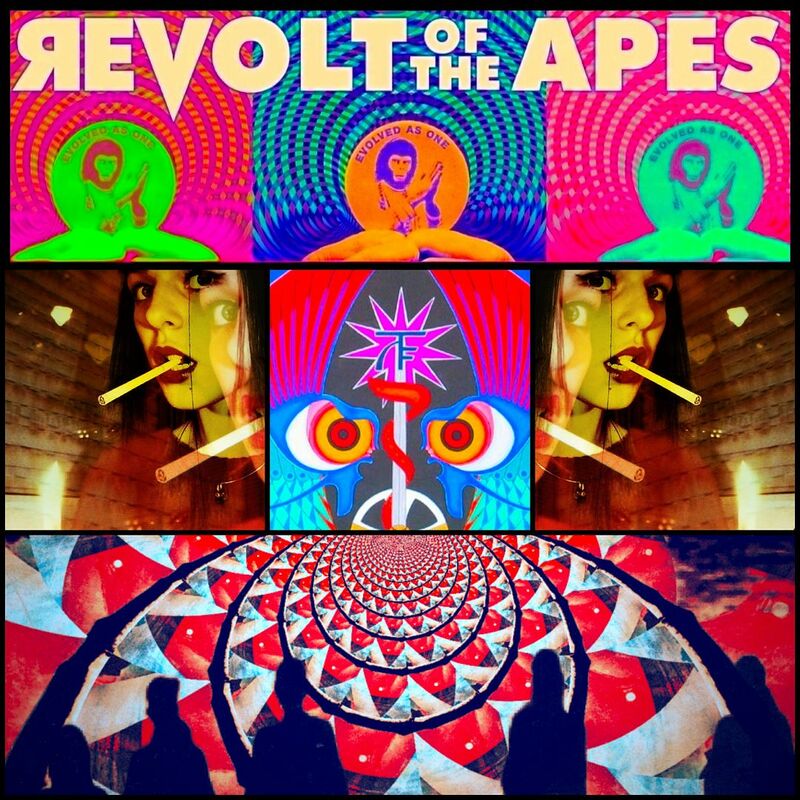 Modern yet classic, indebted to the past but never weakly nostalgic, these veterans of Psych Fest wars have a little something to offer those interested in just about everything (psych-surf-punk-shoegaze-rock? Sure! ), and they’re not afraid to wear fake moustaches while they do. We should all be so lucky as to have friends like The Vandelles. Goodbye, Austin Psych Fest 3! Hello, Vandelles! Guitarist Christo, drummer Sue and bassist Lisha testify below. How often has someone actually gone to one of your shows, actually persisted through your entire set, and actually approached you afterwards just to prove their own insanity, by declaring, “I totally thought you guys would be The Vandals!”? Christo: Most of the time, it’s more like you are trying to tell someone the name of the band in a loud environment and they think we say the Vandals. Ironically, Sue actually also does play drums for Devo and Nine Inch Nails. Your set at last year’s Austin Psych Fest was notably loud – even among three days of notably loud bands. What does volume add to the live experience that you just cannot get from records? Are you used to the volume by this point? Do you think much about how your hearing may be affected in the long run? Christo: I don’t think the Psych Fest set was all that loud compared to other shows we have played but yeah, it can be taxing on your eardrums, for sure. Wearing earplugs or scrambling for TP right before the set is a must. Sue: I think it’s made me hypersensitive to sound. The only time I don’t wear earplugs is when we play. Lisha: Personally, I look forward to having one of those fashionable ear trumpets in my old age. Another notable thing about last year’s Austin Psych Fest performance – the set ended with Jason Schwartz having his guitar covered in flames, a spectacular visual finish to a spectacular set. How often have you ended sets in this fashion? Are you pleased or saddened to learn that the two bands I have seen set fire to guitars in person are The Vandelles and Monster Magnet? Lisha: Well, the story there is that Sue and I begged Jason not to set his guitar on fire, mostly out of fear that we would be engulfed in the flames. Jason very politely promised not to. And then he proceeded to set his guitar on fire. Christo: See Sue’s answer concerning Monster Magnet. Sue: Yeah, what he said. I was dying laughing when I read the Monster Magnet question. They live in my hometown and their antics have been a constant source of amusement throughout my teen years, and now an inspiration for the Vandelles stage show. 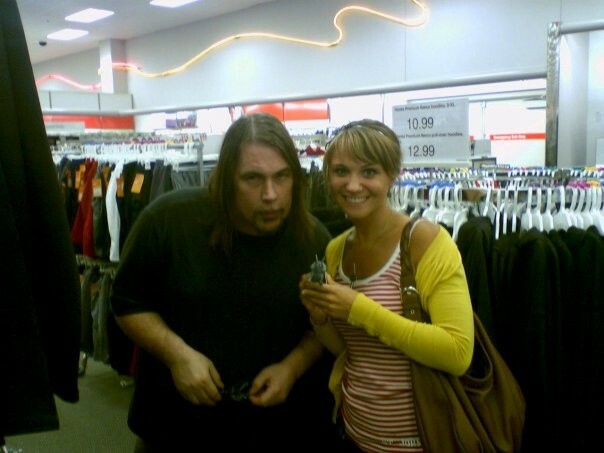 I recently went home to visit my parents and ran into the singer from Monster Magnet in the sock section of Target. I asked him for a picture (which is so on my nightstand, ha!) and he talked to me for 45 minutes about his trip to a reject toy factory in Taiwan. Then he gave me some stellar advice pertinent to the success of the Vandelles, “Don’t do drugs and get fat.” GENIUS! How did you originally become involved with Austin Psych Fest? Are there any bands in particular you are looking forward to seeing this year? Christo: Ringo Deathstarr, Screen Vinyl Image, Sisters of your Sunshine Vapor, Indian Jewlery, the Meek. Lisha: I’m not really sure how it started, probably from having played SXSW for many years and becoming close to other Austin bands and the scene there. Last year was really spectacular and brought together some wonderful bands. I remember being blown away by The Strange Boys. I think we’re all really excited to see our friends from Ringo Deathstarr play again. If you’re to consider your own musical history for a moment, what are the one or two most transformative musical experiences of your life? What are the moments that made you think, “This is exactly what I want to be involved in”? Christo: Probably just the first time I played electric guitar and then the first time I played electric guitar ON WEED! Sue: My dad took me to see Jan and Dean at Great Adventure when I was in elementary school. I knew then I either wanted to be Gidget or play in a surf band. Lisha: For me, it was the New Jersey punk scene. Something about being crowded with a million friends into tiny dank basements with sweating walls, screaming along the lyrics to our favorite songs made me think: yes, this is for me. The kids in those bands had so much heart when they played and I really wanted to be a part of something like that. Christo: Any fast food. Also ,ribs. Lisha: Once driving back from Texas, Jason and I stopped at Taco Bell for nearly every single meal in a 48 hour span. I couldn’t look a cheesy fiesta potato burrito in the face for weeks. 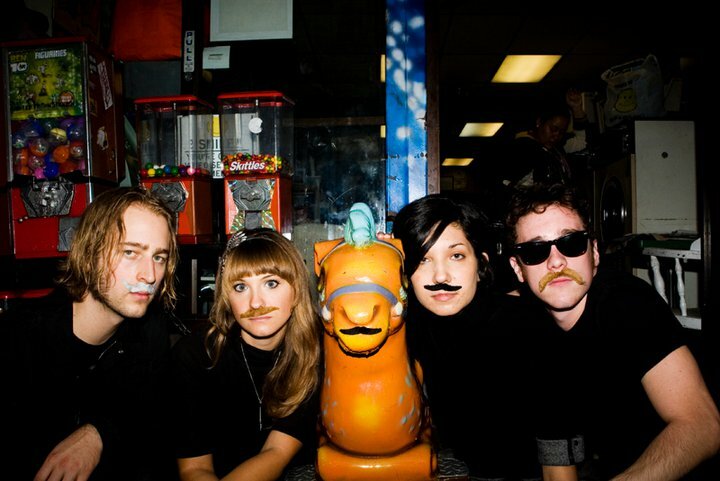 What does it mean (if anything) to be a band from Brooklyn in 2010? Kurt Vonnegut once described New York City as being “permanently cruel” – what do you think? Where are the members of the band from originally? Christo: Originally from CT, spent 7 years in Boston before moving to NY. Sue: NYC is a tough place to start out in. No matter when you’re playing, there’s always going to be about 100 other decent shows going on, too. There was definitely a time when I started to feel a lot of bitterness about the whole matter. But you just need to accept that and find a good niche. I was born in Brooklyn (take that hipsters) and then moved to New Jersey then back to Brooklyn about 4-5 years ago. Lisha: I was born in Houston, but moved to New Jersey early on and then to Brooklyn. They start you young on the Texas pride, so I’m always really excited when we play there. I agree with Sue– it’s really hard to be in a band in New York, just because there are so many bands here and there’s a huge music scene. But I think we’ve found a good community in Brooklyn, so now everything is beautiful and nothing hurts, as KV says. At the same time, there seems to be almost an understated yearning for California in The Vandelles music – a yearning that goes beyond the surf-influence, and toward a desire for the sunshine to break through the clouds, for the surf to not be made of asbestos and asphalt. Is this real or imagined? What did Jimi Hendrix mean when he said, “And you will never hear surf music again”? Sue: I grew up by Coney Island and the Jersey Shore, so the beach has always been a big influence. New York is the coldest, saddest place ever in the winter, but the best once the summer hits. I think we have that whole Endless Summer dream year round. It’s kind of innate. Lisha and I were once talking about moving to Austin and we both realized it’s an impossibility, because we can’t fathom being more than a half hour from an ocean. Lisha: Truer words were never spoken. Christo: I like the new Serena Maneesh a lot. 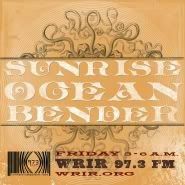 A lot of ambient and shoegaze music as always for me, too. Sue: I am in loooooove with Best Coast. Girl group beach punk? Perfection. Lisha: It’s been a while since I’ve discovered a band that makes me obsess over their music. In those times of trouble, I usually turn to Miss Patsy Cline. What’s next for The Vandelles? Christo: I am working on our own custom line of pogs at the moment. Sue: I can’t top that. Wonderful interview! I love them. One of the best bands (if not THE) in New York.